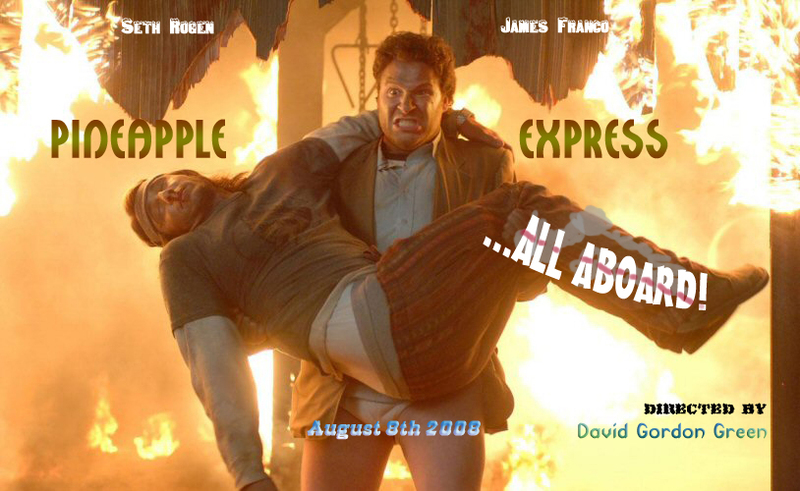 My most anticipated movie of the year has finally arrived: Pineapple Express! The trailer was as perfect as a trailer could get and you’ve got to love David Gordon Green… so away I went! The critics have been a bit iffy on this action-spoof comedy, but the majority appreciate it for what it is, which is always nice to hear. A very unknown, but always focused director (David Gordon Green) took on the job. This to me was a gigantic surprise. As a fan of “Apatow comedies” I was very unsure of a heavy-hitting, minor director such as DGG driving this explosive comedy, but I gotta say, I loved every minute of it. From the nostalgic-esque opening – the scene, set in the 30’s and opening with an ominous score that one would hear in a film like The Invasion of the Body Snatchers – to the sarcastic ending which is basically a re-cap of the film in a couple of minutes, the team that wrote and directed the film really demonstrated how a fun movie should be made. David Gordon Green also embraces the campiness of the 70’s action films when he is in control of the fight sequences. He has it all locked now. Just to add onto what is already a directorial achievement, he hits home with classic techniques such as: fast-cuts, action-disco music, freeze-frames & sped-up film. All of these things are considered cliché among he the cinema-freaks of today, but how they are used in the film is somewhat of a reinvention, if you will. David Gordon Green does no wrong, and in doing so he creates the best “Apatow” film to date.Once again, Seth Rogen and Evan Goldberg write a gut-busting, pop-culture filled comedy – which does get old, I must admit, but like I said in the paragraph before “this film is sort of a reinvention”. Together, Rogen and Goldberg write a stoner film with some heart, some pot and a lot of gusto. This time, the characters are all basically scum – well, apart from naive and innocent Saul. You love the two main characters by the end, but in the first bit of the film Dale has a personality that most of us hate; an annoying rambler, selfish and spiteful. The character development that he undergoes is pretty well written, so kudos on that one, boys. The action segments range from realistic to cliché to the level that they are at today. The film is somewhat of an action smoothie with pot and hilarity thrown into it. Enjoy! Alright, so if you don’t know the plot of the film by now, I’ll lay it out for you. A pothead, Dale Denton is a process server (one that… shines shoes?) who is out of pot. In need of ‘the stuff’, he goes to his fairly new dealer, Saul, who is as lovable as a teddy bear. Saul introduces a specialty chronic to Dale; this is Pineapple Express. Being caught up in the moment of being around such great pot, Dale overstays his welcome (in his opinion) and is forced to form a bond with Saul. As soon as Dale does what he has to, he rushes out of Saul’s apartment to serve a man named Ted Jones. At Ted Jones’ house – smoking a joint before serving him – Dale sees Jones kill an Asian. He scurries to get away from the scene of the crime. Panicking and not knowing what to do in this situation, he rushes off to Saul’s house to tell him what he had seen. This is where the film picks up. From here on out the film contains spoofs and ideas that everyone has come across everyone once in awhile while watching an action movie (such as: what would happen if a person missed their target when they shot?). Clocking in at almost 2 hours, the film is not a moment too long or a moment too short – one of the most enjoyable films you’ll ever see, especially at the theater.